American Civil Rights activist, Baptist minister, and politician. He was a candidate for the Democratic presidential nomination in 1984 and 1988 and served as a shadow U.S. Senator for the District of Columbia from 1991-97. 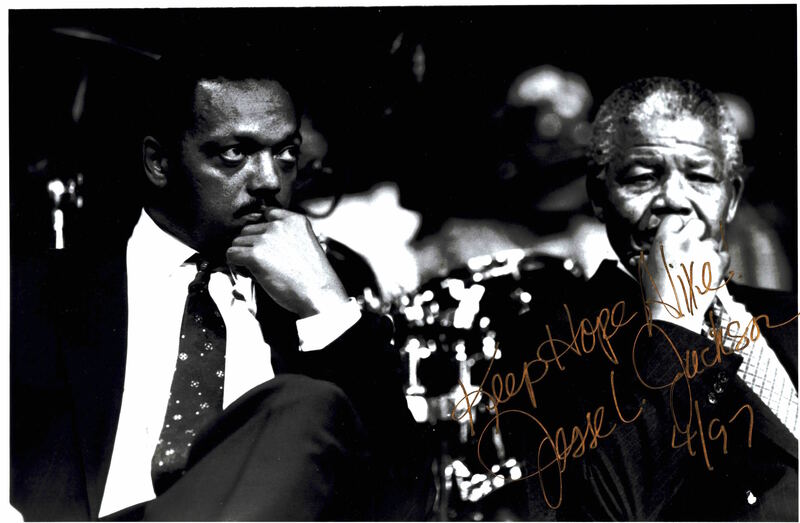 SP – Signed 10″x8″ black and white glossy photograph boldly signed in gold marker pen “Keep Hope Alive, Jesse L. Jackson 4/97.” Reverend Jackson is seated with the late Nelson Mandela. Near mint. Jackson is the founder of the organizations that merged to form Rainbow/PUSH. Former U.S. Representative Jesse Jackson, Jr is his eldest son. Jackson was also the host of Both Sides With Jesse Jackson on CNN from 1992 to 2000.